Republic Day (26th of January) is a special day for India, celebrated annually as a National Festival all over India to commemorate and honor the day when the Constitution of India came into force (26 January, 1950) as the governing document of India. Republic Day is very important day of the year for the people of India and we celebrate it annually on 26th of January since 1950. Let your kids and children know about the history of celebrating Republic Day in India through the use of very simple essay on Republic Day. All Republic Day essay are simply written especially for the use of kids and children and helping parents to easily find it online on this website under various words limit. By going through this essay you will be able to know the answer of many questions like what is the history of Constitution of India, How Republic Day is Celebrated, Republic Day celebration in Schools, Republic Day Celebration at Rajpath, New Delhi, and what is the Significance of Republic Day, etc. 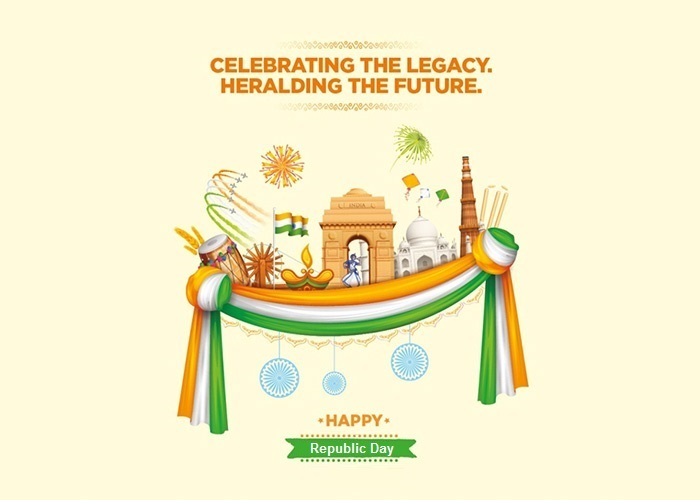 Our country, India celebrates the Republic Day every year to honour the day when Constitution of India came into force. The Constitution of India replaced the Government of India Act 1935 as a governing document of India on the special day of 26 January in 1950. It has been declared as the national holiday by the Government of India. People in India enjoy this great day by celebrating in their own ways. On this day a parade takes place in the national capital of India, New Delhi at the Rajpath (in front of the India Gate) in the presence of President of India. India celebrates the Republic Day every year on the 26th of January since 1950 when Constitution of India came into force. Republic Day in India is of great importance in the history as it tells us all about each and every struggle of Indian freedom. People who were fighting for Independence of India took a pledge on the same day in 1930 at the banks of River Ravi in Lahore to achieve a complete independence (Poorna Swarajya) of India, which came true in the year 1947 on 15th of August. On 26th of January in 1950, India was declared as a Sovereign, Secular, Socialistic and Democratic Republic which means the people of India has the power to choose the government for the country. It is celebrated by organizing a major event with special parade at Rajpath, New Delhi in the presence of President of India by unfurling the National Flag and singing the National Anthem. Republic day is celebrated on 26th January every year across India. India got its independence on 15th of August, 1947 and around two and half years later it became a Democratic Republic. This day is of great importance for every Indian since the constitution of India came into force and India was declared as a republic country after long years of freedom struggle. In a meeting held on 28th August 1947, it was decided that a Drafting Committee will be appointed to draft a permanent constitution for India. Dr. B.R. Ambedkar was made the chairman of Drafting Committee who took the responsibility and submitted the constitution of India to the Assembly on 4th of November, 1947, which was adopted on 26th November, 1949 and came into force on 26th January, 1950. Republic day is a national holiday in India when people celebrate this great day of honour in their own ways. Everyone is glued to television to watch the Republic Day parade whereas children participate in Republic Day programmes in schools. The main celebration takes place at Rajpath, New Delhi where President of India hoists the National Flag and parade is organised by the Indian Armed Forces. People also pay tribute to all the freedom fighters of the Indian freedom struggle who sacrificed their lives for the nation. In India, 26th of January is celebrated as Republic Day every year because the Constitution of India came into force on this day. It is celebrated as the national festival of India which has been declared as a national holiday. Gandhi Jayanti and Independence Day are other two national holidays of India. On 26th of January in 1950 our country became a complete Democratic Republic after reinforcement of the Constitution of India in the Indian Parliament. On this day a great Indian army parade takes place which generally starts from the Vijay Chowk and ends at India Gate. Indian Armed Forces (Army, Navy and Air Force) salute the President of India while parading on the Rajpath. The parade also showcases the capabilities of the Indian Armed Forces exhibiting the advanced arms and warfare of the country. It is followed by the tableau or ‘Jhanki’ of each state displaying their culture and traditions. Students celebrate this day in the schools and colleges by participating in various events like parade, flag hoisting, speech competitions, plays and various other cultural programmes. Republic Day is the national festival of India which reminds us about the sacrifices of our great leaders and freedom fighters who did not think about themselves and their families and happily sacrificed their lives for the nation. The democracy which we have received should be valued by everyone and should not be taken for granted. Everyone should contribute their bit for the development of the nation and spread peace, love and harmony. 26th January is known as Republic Day which is celebrated by the people of India every year with great joy and enthusiasm. It is celebrated to honour the importance of being a Sovereign Democratic Republic which was declared after the enforcement of Constitution of India in 1950 on 26th of January. It is also celebrated to enjoy and remember the historic Independence of India from the British Rule. Schools organize various cultural programmes on the occasion of Republic Day. Students participate in these programmes with great zeal and enthusiasm. Various competitions like essay writing, speech, drawing and painting etc are conducted in all the educational institutions. Students also conduct plays and skits showing the Indian independence struggle of freedom fighters. Government of India organizes a major event every year in the National capital, New Delhi where flag hoisting event, Indian Armed Forces parade and various other activities are held in front of the India Gate. People start to assemble at Rajpath in early morning to witness this great event. A parade of all three wings of Indian Armed Forces starts from the Vijay Chowk which also displays the advanced warfare capabilities of the country. Military Bands of all the regiment, NCC Cadets and ex-army men also take part in the parade. Tableaus from all the states are also displayed after the parade showing the rich tradition of India. Folk dances and various stunts are also exhibited by the participants and army personnel on Rajpath. Republic Day is not just a national festival but it is a celebration of democracy and independence. This is the day when we remember our freedom fighters and thank them by paying tribute to them for their immense sacrifice. It is because of them that we are living in a democratic nation and breathing in an independent country. Our motherland, India was slave under the British rule for long years during which Indians were exploited and forced to follow the laws made by British rule. After long years of struggle by our great freedom fighters, finally India became independent on 15th of August in 1947. Around two and half years later Indian government implemented its own Constitution and declared India as the Democratic Republic on 26th of January in 1950. The declaration of India as a Sovereign Democratic Republic made its citizen to celebrate 26th of January as a Republic Day every year to commemorate this great day. Republic Day marks the remembrance of the day when the constitution of India came into force. The importance of this day could not be ignored as this was the day when India became republic and where the government is for the people, of the people and by the people. Celebrating Republic Day every year is the great honour for the people living in India as well as abroad. It is the day of great importance and celebrated by the people with great joy and enthusiasm by organizing and participating in various events. People wait for this day eagerly to be the part of its great celebration. Preparation work for the republic day celebration at Rajpath starts a month before. A major celebration arrangement in the national capital, New Delhi and state capitals takes place all over India. Celebration at Rajpath, New Delhi starts with the National Flag hoisting by the President of India and singing of the National Anthem. After this, Indian Armed Forces parade, state-wise ‘Jhankis’, march-past, awards distribution etc activities takes place. On this day, the air is filled with the scent of patriotism and we can hear the sound of patriotic songs and national flag flying high everywhere. Students of schools and colleges are very keen to celebrate this event and start the preparation around a month before. Almost every Indian citizen gets ready early in the morning to watch the celebration and parade at Rajpath, New Delhi on their television. National flag flying high on every house is very common on this day when people forget their personal issues and celebrate this national festival with a sense of nationalism and togetherness. Republic Day is not the only day when we should show our patriotism towards our nation instead it should be showcased in our daily routine. We should strictly follow our fundamental duties and respect the constitution of our country then only we can help our country to become a developed nation where everyone lives in prosperity, peace and harmony and that will be the real tribute to our freedom fighters. 26th January 1950 was the day when the Constitution of India came into force. This was the day when India turned to a republic country after the British colonial rule of 300 years. Since then we commemorate the day by celebrating the Republic Day on 26th January every year. The Constitution of India, which is also regarded as the supreme law of our country was framed by Dr. B.R. Ambedkar who was the chairman of the constitution drafting committee. The hard work and intelligence of Dr. Ambedkar and the members of the drafting committee helped our nation to get our very own constitution which declares India as a Sovereign, Socialist, Secular, and Democratic Republic nation. Republic Day has importance in every heart of an Indian citizen. This is one of the national festivals of India which embarks the sense of patriotism in everybody’s mind. This is one of the occasion which helps to introduce the younger generation to our great Indian history and culture. This is the day when we remember our great leaders and freedom fighters who sacrificed their life for the country. Republic Day also teaches us the importance of unity and how it helped in the Indian freedom struggle to defeat the much powerful British Empire. Mahatma Gandhi’s non-violence movement teaches us that how we can defeat a much powerful enemy without lifting a single weapon or shedding a drop of blood. Republic Day also makes us remember that all the citizens of the country are equal for the constitution and there is no discrimination on the basis of caste, creed or religion. The Republic Day is celebrated across the country with full enthusiasm, zeal, joy and off course, with the real sense of patriotism. The celebrations in schools are very common sightings on this day where children are smartly dressed up carrying the tricolor and wearing the badges of our great freedom fighters. Flag hoisting ceremonies, cultural programmes, speeches, various competitions etc are conducted in all the schools as well as in the government and private offices. The President of India addresses the nation on the eve of Republic Day on 25th January and is telecasted on all the radio and television channels. The main celebration takes place in New Delhi at Rajpath near India Gate on 26th January. The Republic Day celebration starts with the hoisting of national flag by the President of India at Rajpath in the presence of an honorable Chief Guest. After which the national anthem is sung and tribute is paid to all the martyrs who sacrificed their lives for the country. President also presents the gallantry awards to the civilians and soldiers who displayed outstanding courage and bravery. The picturesque event of the Republic Day celebration starts with the parade of the Indian armed forces which is presided over by the President of India. He also takes the salute of the parade being the Commander-in-Chief of the Indian Armed Forces. The parade also showcases the military capabilities of our country ranging from tanks to missiles and fighter jets to guns. There are also various mind-blowing performances by the Indian Air Force, Navy and military personnel. It is followed by the colourful tableau from various states which exhibits the culture and traditions of the state. Beating the Retreat is the integral part of the Republic Day celebration and also an age old traditional ceremony after the Republic Day. The ceremony is held on 29th January at Vijay Chowk, New Delhi. Military Bands, Trumpets, Drums etc from various Army regiments perform in sync playing various patriotic tunes. Beating the Retreat also marks the official closing of the 4 days long Republic Day celebration with a positive note. Republic Day instills the sense of patriotism in the hearts of the people. This is the day when all the citizens of our country unite together under the single blanket of togetherness and celebrate the day with zeal and zest. It also reminds us the value of democracy and to perform our fundamental duties to make our country self reliant, developed and resilient. Republic Day is one of the great national festivals of India celebrated on 26th January every year to commemorate the day when Constitution of India came into force. India was under the British rule for over hundreds of years and was forced to follow the harsh rules and laws which were against the freedom of Indians. The immense sacrifices of our great freedom fighters and under the guidance of great leaders helped India to achieve its freedom on 15th August 1947. Around two and half years later, India got its constitution which was adopted on 26th November 1949 and came into force on 26th January 1950. The day ‘Constitution of India’ came into force was a great day in the history which made India a Sovereign Democratic Republic and gave the right of choosing government in the hands of the people. After the independence of India on 15th August 1947 the country was governed by the ‘Government of India Act 1935’. The necessity of a constitution for the country led to the appointment of a Drafting committee on 28th August 1947 which was headed by Dr. B.R. Ambedkar. The Drafting Committee submitted the draft to the Constituent Assembly which was adopted on 26th November 1949 (celebrated as Constitution Day every year) and came into force on 26th January 1950. The first Republic Day of India was celebrated on 26th January 1950. The first President of India Dr. Rajendra Prasad hoisted the national flag at Irwin Stadium (Now Major Dhyanchand National Stadium), Delhi followed by singing of the National Anthem. The Chief Guest of first Republic Day was Indonesian President Dr. Sukarno and his wife. Dr. Rajendra Prasad took the salute of the armed forces and this historic event was witnessed by more than 15000 people. A constitution of a country is the most important document for its people and its development and the day it comes in force is an important day in the history of a nation. 26th January is also a day which plays a very important role in the life of every citizen of India because this was the day when freedom and right to choose the government for the country was given in the hands of its citizens. The constitution also defined the basic fundamental rights for its citizens and gave the freedom of speech, equality, liberty and justice to the people so that they can live with dignity, respect and can express themselves without any fear or force. Republic Day is the day which reminds us about the struggle and sacrifices of great freedom fighters who gave up their lives for the nation. This is the day which helps to showcase India’s rich ‘Unity and Diversity’ culture to the world. Republic Day also makes the people aware of their rights and their duties towards the nation and it paints the nation in the single colour of patriotism and unity. In the year 1929, during the Indian National Congress meet at Lahore the demand for ‘Purna Swaraj’ or full independence was made and it was decided to declare 26th January 1930 as ‘Purna Swaraj Diwas’. After 20 years, when the Constituent Assembly was finalizing the date to make constitution come in force, 26th January was decided unanimously in order to honour the great leaders and freedom fighters who were first to demand ‘Purna Swaraj’, and making Constitution of India come in force was the completion of being fully independent. The grandeur of the main Republic Day celebration can be only witnessed at Rajpath, New Delhi where the President of India hoists the national flag which is followed by singing of the national anthem and salute by various regiments of the Indian Armed Forces. The day also commemorates the martyrs of the freedom struggle by paying them warm tributes and also awarding the soldiers of Indian forces for their great act of valour and heroic courage in the battlefield. Republic Day parade is the main attraction of the 26th January celebrations which showcases the defence and warfare capabilities of India. The synchronized march past of the soldiers of various regiments of Indian Armed Forces in their full uniform is an eye catching sight for everyone and fills the heart of audiences with patriotism. The parade is followed by the tableaux from various states and departments showcasing the rich culture and traditional values of the state. The colourful display of the tableaux makes Rajpath filled with vibrancy and energy. The best tableau and regiment also get awarded every year for their best performance in the Republic Day parade. ‘Beating the Retreat’ ceremony is held on 29th January every year at Vijay Chowk, New Delhi. The ceremony is also an official closing of the Republic Day celebrations by outstanding performances of the bands from all the three wings of the Indian Armed Forces. After the performance, the national flag is lowered in the evening which officially puts a rest to the 4 day Republic Day celebrations. India is considered as the largest democracy in the world and Republic Day is the festival of democracy which reminds us about the sweat and blood spent to achieve it. It is celebrated by each and every individual irrespective of its caste, creed or religion and helps to build a nation which is united within and ready to overcome all the difficult challenges. If we really want to celebrate Republic Day in real sense then each and every person of India should take the pledge to work for the betterment of the country and contribute its level best in the progress and development of the nation.